These two simple questions have led me into some pretty thick woods. On one level, the icon is just a device to illustrate a bit of physical knowledge, an armature upon which to hang pointers to the major structures of the human central nervous system. But the publication of this image also can be read, without all that much effort, as a symbol of something much bigger. By referencing Classical and Renaissance art forms, and filtering those forms through the dominant (and dominating) idiom of the day – science and technology – “The Nervous Icon” did more than pay homage to masterpieces of the past, it took ownership of them. It helped, in its own small way, not only to sooth cultural anxieties by signaling continuity and stability in an era of rapid and unsettling change, but to justify imperialism by reframing it as stewardship. Yet, the image undermined its own claims. There is a tentativeness to the pose, an uneasiness, as if the figure fears its next step might cause it to stumble. Interestingly, as we examine “The Nervous Icon’s” history – the attempts by publishers to erase or obscure or simply ignore its heritage in order to skirt copyright issues – the contradictions inherent in its natal ideology, specifically, the contradiction between nationalist empire and international capitalism, are laid surprisingly bare. Big stuff for a blog, and a lot of extrapolation from a little drawing, I know. Perhaps we should take a minute and get our bearings. (NOTE: Updates below) After a month of searching, online and via email exchanges with antiquarian book dealers, I believe I’ve pinned down the first use of “The Nervous Icon.” I think it is reasonable to state that the image that found its way into Hunter’s 1907 text was created to illustrate a 12-volume science and technology compendium titled The Museum of Science and Art, published in London by Walton and Maberly in 1855, and edited by a scandal-plagued but well-connected and incredibly prolific science popularizer with the improbable name of Dionysius Lardner. According to the Wikipedia entry, Lardner, in addition to editing The Museum of Science and Art, and authoring treatises on geometry, calculus and the steam engine, wielded his brief 3-year tenure as a professor of natural philosophy and astronomy at London’s University College as an imprimatur qualifying his editorship of another 12-volume work titled the Cabinet Library and a 133-volume work called the Cabinet Cyclopedia, all published between 1823 and 1856. Though it is hard to say categorically, particularly given the resolution of the available Google Books image, several clues suggest The Museum of Science and Art image is the original. First, the text’s title page’s promoted that the Museum of Science and Art was “illustrated by engravings on wood.” Second, even through the poor scan, it is clear the image does not exhibit the loss of detail suffered by subsequent copies (note particularly the area at the front and back of the brain). And finally there are the call-outs – ‘a’ through ‘p’ – and the dotted lines connecting these call-outs, not only to the body, but to later appearances of our icon as it made its way from London to Spain to New York and into Hunter’s books. Our icon’s introduction via a nineteenth century “encyclopedic” work is quite illustrative. And given its later journey through the waters of international copyright, an appropriate start. Encyclopedias from the eighteenth and nineteenth centuries were in great part celebrations of technological progress. The earlier works, notably Ephraim Chambers’ Cyclopaedia (1728) and Denis Diderot and Jean d’Alembert’s Encyclopedie (1751) represented efforts to capture, encapsulate and predigest the Enlightenment’s explosion of knowledge. As Chambers expressed, there was a fear that “certain ‘inventions and improvements’ might ‘sink in oblivion.” Diderot suggested, encyclopedias were necessary to counter the threat represented by rapid intellectual specialization, “when it will be almost as difficult to learn anything from books as from direct study of the whole universe.” (qtd. in Yeo, 28-29.). These early collections served as mnemonics for the autodidact and functioned both as dictionaries of knowledge and as proto-academic journals, publishing “preliminary dissertations” (Yeo, 30) by leading scientific researchers. But as the eighteenth century gave way to the nineteenth, more general audience focused encyclopedias and compendiums began to function less as intellectual reference works and more as displays of the loot of intellectual conquest. William Mackenzie’s magniloquently titled The National Encyclopedia, a Dictionary of Universal Knowledge by Various Writers of Eminence in Literature, Science and Art (a work which most sources date to the 1880s, but which this review suggests was complete in 1868) provides an excellent example. Pretense fell, articles were shortened, and the more ‘popularly priced’ books evolved into near random collections of ideas and artifacts – illustrations of the bones of the arm, the Temple of Denderah (sic), Laocoon and His Sons – all thrown together to form an undifferentiated aggregate, a cement, the foundation of empire. Though no one seems to have doubted an empire’s right to appropriate these images, who exactly within that empire had the right to reproduce the texts and drawings generated considerable conflict. Doig writes, “British encyclopedia editors became embroiled in the copyright debates of the time because of the contradictions inherent in their enterprise” (443). This led to what Doig labels “singular protestations” where editors would complain about others copying a work they had copied from someone else. This hints at a larger story. But before we go there, let’s back up a bit. Though I have been unable to find an earlier example of “The Nervous Icon” than the one that appears in Lardner’s 1855 Museum of Science and Art , it takes little effort to find the reference works Lardner’s artist used to create the image. 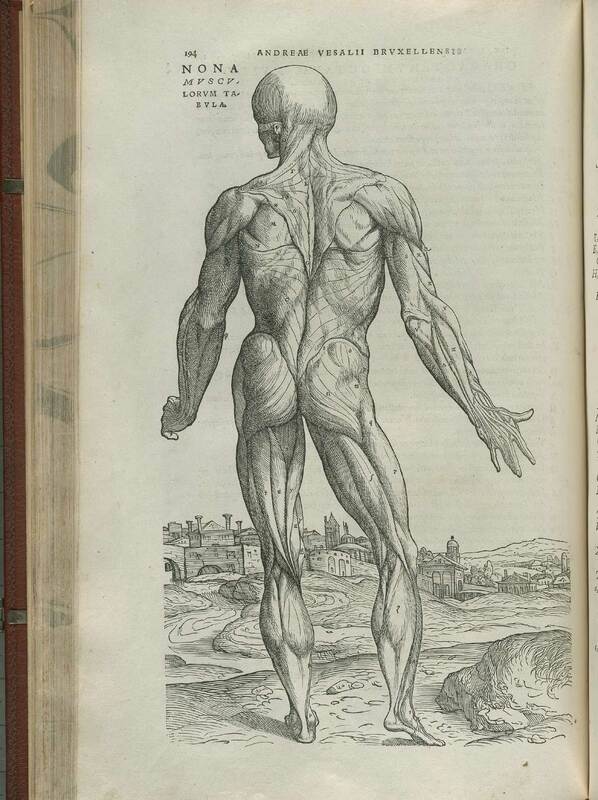 To find the source, we dig past Chambers’ Cyclopaedia to the most famous textbook on human anatomy, Andreas Vesalius’ 1543 Renaissance masterpiece, De Humani Corporis Fabrica. The Fabrica is an amazing work of artistry and craftsmanship, with plates attributed to the “studio of Titian.” The National Library of Medicine has scanned and posted all of the book’s plates. All we need to do to gain a complete illustrator’s reference set for our icon is combine the hands from page 170 with the “from the back” pose from page 194. (For a fascinating tour of history of anatomical illustration, I recommend the National Institutes of Health’s online exhibition, Dream Anatomy.) 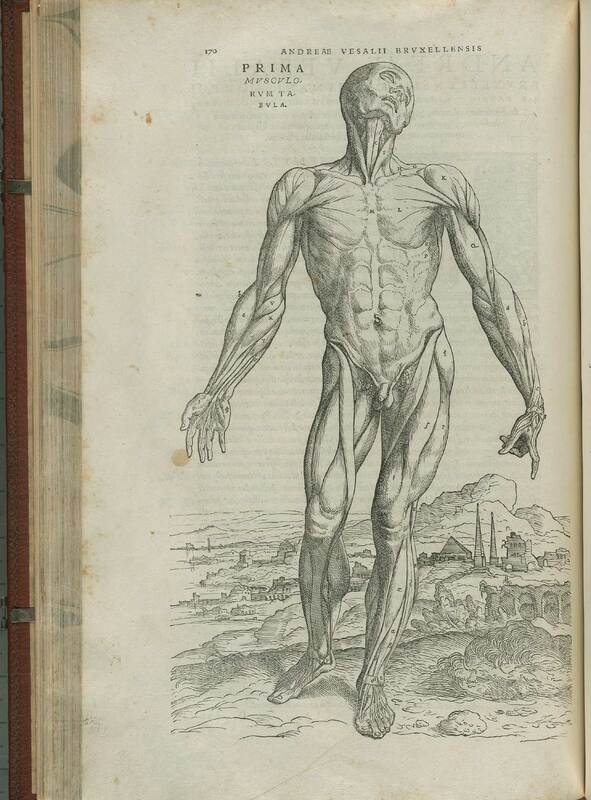 The anonymous artist who created our icon seems to have combined illustrations from Vesalius’ work with a cruder illustration of the nervous system then in circulation to create our icon. Though the illustrations below, all from different London publishers, closely resemble one another, they are not exact copies. British publishers appear to have felt constrained, perhaps by technology, but more likely by copyright convention, from simply re-photographing and reprinting the image. The leftmost (1855) and center (1871)* images are very close cousins, but not exact duplicates. The rightmost (1888) clearly references the first two, but is obviously not a tracing. From left to right: Original illustration from Museum of Science and Art by Dionysius Lardner, published by Walton and Maberly, London (1855); a close reengraved copy (notice the larger head, lower shoulder nerves and greater density of nerves in the trunk) from Elementary Anatomy by St. George Mivart, published by Macmillan and Co., London (1871? ); and a clearly referenced (but artless) redrawing from Animal Physiology by William S. Furneaux, published by Longmans, Green & Co., London and New York (1888). As we will see, when this image crossed the Atlantic, which it first did in 1875, American publishers at first felt free to simply copy the image without attribution. Books intended only for domestic distribution within the United States did not have to worry about copyright challenges until the U.S. revised its laws in 1909. However, not long after, U.S. publishers would begin, as British publishers had from the start, to either drop the illustration from their books or redraw and alter it. What does any of this mean? The answer to that question will have to wait until Part III. *I believe, but have been unable to confirm, that “The Nervous Icon” appeared as it is presented here in the 1871 edition of Elementary Anatomy by St. George Mivart, published by Macmillan and Co., London. This scan is from a later (1883) reprint. Continued in The Nervous Icon – Part III. Doig, Kathleen Hardesty. 2003. “Review: Encircling Encyclopedias.” Eighteenth-Century Studies 36: 441-444. Yeo, Richard. 1991. “Reading Encyclopedias and the Organizations of Knowledge in British Dictionaries of Arts and Sciences, 1730-1850.” Isis 82: 24-49.